Honeymoons are something special. The weddings been done and dusted and it’s now time to celebrate the union between you and partner, how in love you are and the beginning of your new life together. Picking the location to do this can sometimes be a difficult task, considering all the wonderful destinations around the world. But when we think of honeymoon destinations, we frequently only consider the obvious options such as the Maldives, Bora Bora or Thailand for instance. However, there are so many alternative places often in the same country that will make your honeymoon one to remember for years to come. Here are our picks for some spectacular honeymoon destinations that you’ve never even thought of. Heading to the Philippines? Boracay Island is one of the most famous and visited parts of Philippines, known for its beautiful beaches covered in soft white sand and happening nightlife. But it’s also difficult to get to, is over-run by tourists and the parties put the full-moon parties of Thailand to shame. It doesn’t exactly scream honeymoon romance. Why not try El Nido, Palawan in the Philipines instead? Located 428 Kilometres south-west of Manila this paradise is said to be the most beautiful island destination in the whole of the Philippines. Known for its extraordinary natural splendor and ecosystem, honeymoon couples can enjoy unspoilt beaches, crystal clear waters and an amazing underwater world. To really make your honeymoon special why not choose an overwater cottage on Lagen Island or Apulit Island? It’s the same luxury you’d find at the Maldives or Bora Bora but closer and with a smaller price tag. Bali is one of the most popular tourist destinations in the world especially with Kiwi’s because of it’s proximity to New Zealand, show-stopping natural beauty, friendly locals and rich culture and heritage. It’s a good option for a honeymoon for the same reasons. 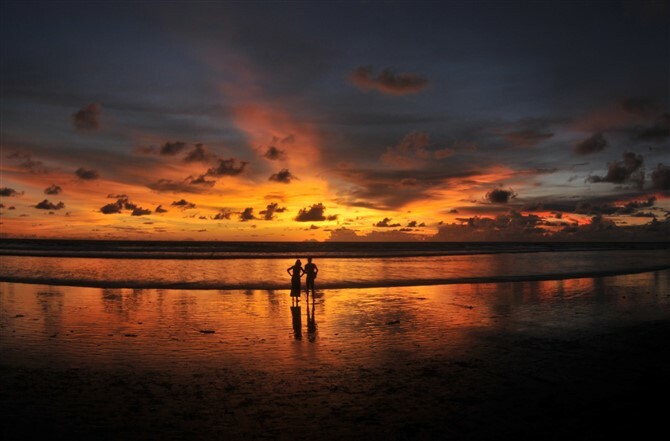 But let’s face it, you’ll probably pay a bribe at some point of your trip, Kuta Beach is filthy, and the nightlife in Bali is often dangerous especially along the Kuta tourist strip. There are other options in Indonesia that could be a more suitable destination for your honeymoon. Catch a speedboat from Bali and head to the north-west end of Lombok to one of the three Gili Islands- Gili Trawangan, Gili Meno & Gili Air instead. You’ll find sparkling white sand and beautiful turquoise waters and you’ll be greeted with sensational sunsets over Bali’s Agung. It’s been nicknamed paradise for good reason. Unlike Bali, the three Gili Islands will not permit any type of motorised transport on them and, therefore, rely on bicycles, horse and carts. The serenity is amazing and makes you feel like you’ve gone back in time. For accommodation, you can choose between a range of hotels, luxury villas or a boutique bungalow to really make your honeymoon special. 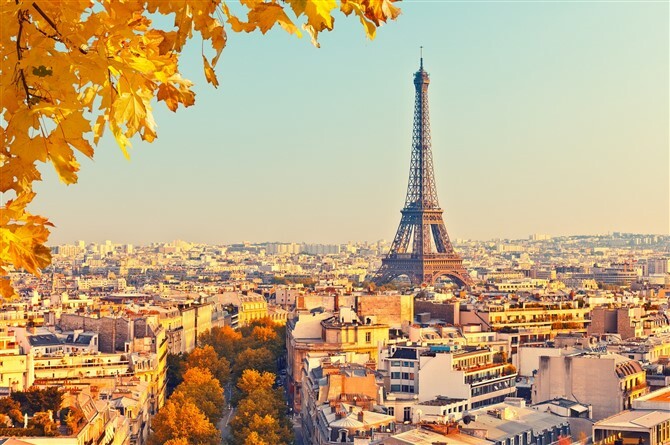 Paris, the city of lights and love is an obvious choice when it’s come honeymoon destinations. It’s certainly beautiful and romantic. The Eiffel Tower, Sacre Coeur and Pont Alexandre really are spectacular. And writing your names on a padlock and attaching it to the Pont Des Arts is truly the epitome of romance. But Paris is exorbitantly expensive. Many parts are dirty and smell. The locals definitely can be rude. And that padlock you just attached to the Pont Des Arts is likely to be cleaned up by Town Hall not long after you’ve attached it there to make room for a new one. Bordeaux, a port city on the Garonne River in the Gironde department in Southwestern France is the world’s major wine industry capital. The city’s nicknames are “La perle d’Aquitaine” (The Pearl of Aquitaine), and “La Belle Endormie” (Sleeping Beauty) references the old centre, which has now been completed renovated. 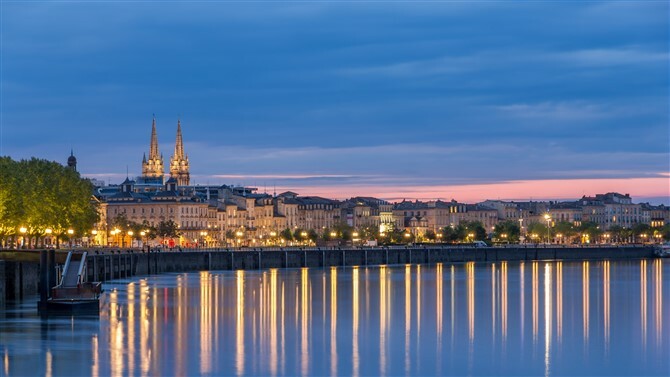 Bordeaux closely follows Paris for having the highest number of preserved historical buildings in France. Your honeymoon in Bordeaux will be made extra special by the majestic vineyards and wine houses that line both sides of the Gironde river. Book a romantic bed and breakfast and spend your time driving through the spectacular wine regions and wine tasting in the winery’s. Instead of Hamilton Island Why Not go to Makepeace Island? Nestled in the Whitsundays and at the heart of the Great Barrier Reef in Australia, Hamilton Island is one of the most popular and sought-after honeymoon destinations for both Australian locals and people from around the world. 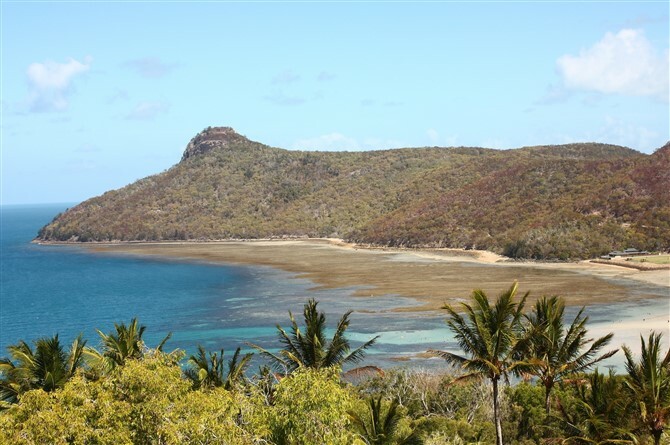 It’s a great spot to explore the Great Barrier Reef or the famous Whitehaven Beach. However, it also has a reputation for being over-priced and overrated. You need a golf buggy to take you around anywhere and shopping for anything is limited and expensive. Why not try Makepeace Island instead? Makepeace Island is a private hideaway owned by Sir Richard Brandon and Virgin Australia Co-founder Brett Godfrey. The secluded island is the essence of absolute luxury and can accommodate 22 people- or you can hire it exclusively for you and your new husband or wife. Located slightly upstream from Noosa Heads the Sunshine Coast is a boat ride away. The best thing about Makepeace Island? 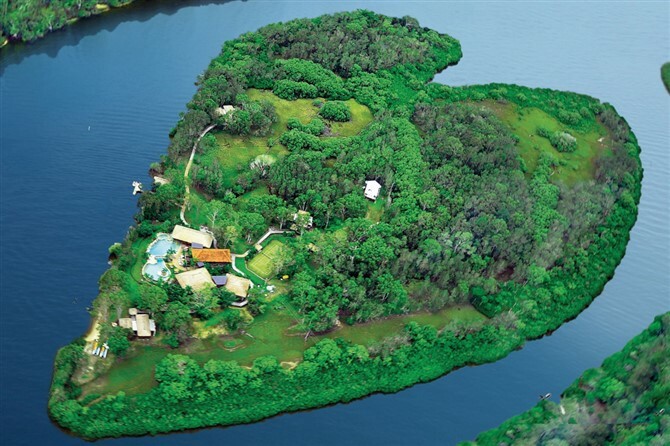 The 25acre island is shaped like a heart! What says romance more than the island you’re staying on being an actual heart? It also offers it’s own riverboat, a two-storey open aired Balinese wantilan for relaxing a, 500,000-litre lagoon pool, tennis court and pavilion, spa facilities, theatre, office facilities and an expansive indoor bar designed for entertaining on a grand scale. No matter where you head to for your honeymoon Turn your favourite memories into beautiful canvas prints. It’s easy to start online here. Beautiful Weddings are Different Weddings! ← Previous Post: Beautiful Weddings are Different Weddings!